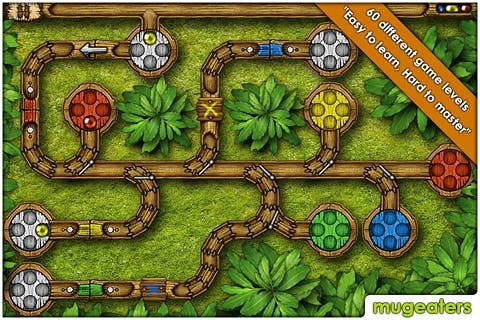 Woozzle is such an easy game to go ahead, but if you are dare enough to dig deeper levels you will be in trouble. The game contains a total of 60 interesting levels, which open as five each. So once you have completed the initial five then only you can explore the next five vice versa. What I have initially liked in the app is it’s well made graphics design and the music. It’s fully greenish and the murmuring bird’s sound in the back drop is nice. It gives a real live jungle effect to the core. Watch out the game play instructions on tapping the first level and all you need to do is just collect the balls rolling on the wooden pipe into the trays that contain four holes. Once you enter into more levels there will be different colors for the balls and trays. So you need to guide the ball to the appropriate tray in same color through the wooden pipe. Note that you need to slide the ball to drive the balls from one tray to another. I found the game goes very interesting on reaching more levels where you can see so many changes in the game play. There are road converters, ball color changers, horizontal and vertical road pointers, and much more. Amazingly when these come into play the game gets the real momentum. This is what I have found within the first 10 levels only! So I am pretty sure I can find a lot more interesting game play in the deeper levels. There is Game Center support, Facebook sharing on the app so that you can share and play the game with your friends. All these exciting features are available on the app store for just $0.99. If you are a game lover especially puzzle games, then this app is a much recommended one to kill your time.